The liberal media has been bashing Congressman Stockman because Stockman has missed a week or so of votes and didn't tell anyone that he was on a secret congressional visit to terrorist nations. 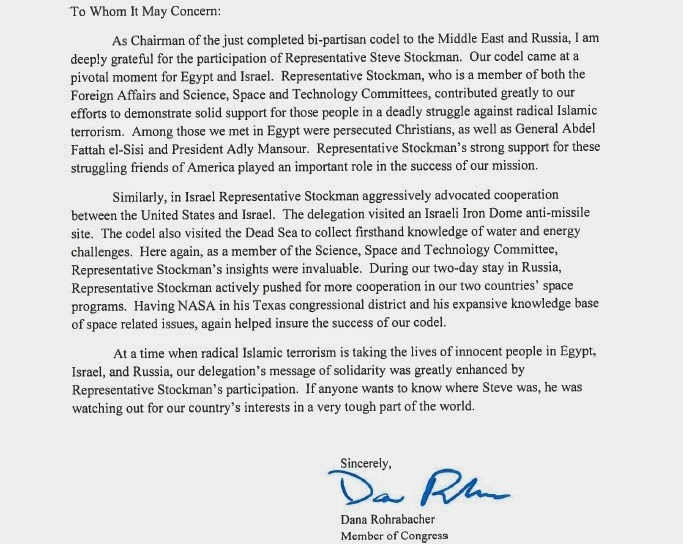 I guess the liberal media thinks Congressman Stockman should have alerted the terrorists that him and other Congressmen were going to be there? Congressman Stockman is running for US Senate against a more moderate John Cornyn. It is no secret that the liberal media so not want Stockman to win. The press makes no mention of the fact that I serve on the Subcommittee on Europe, Eurasia, and Emerging Threats. The press wanted me violate the State Department policy that prohibits Members of Congress traveling abroad on official business from publicly disclosing their whereabouts. I was not going to jeopardize the safety of the Congressmen and Congresswoman I was traveling with. There were five bombings in Egypt only two days after we were there. While we were in Israel, there were 17 missile strikes and three suspects were arrested for planning to blow up the U.S. Embassy. So glad you brought up Big John, there is a good place in the private sector for him and we should do our best to help him get there.